This is the horrifying moment a Siberian tiger mauls a defenceless zookeeper as terrified visitors desperately try to save her. The woman was bringing food for the huge beast when it suddenly jumped on her and pinned her to the ground. Amazingly, her life was saved by the shocked onlookers who shouted and threw stones at the tiger in a bid to distract it. Men even lifted a table and chairs from a nearby cafe, hurling them over the fence to distract the 15-year-old male tiger called Taifun, or Typhoon. 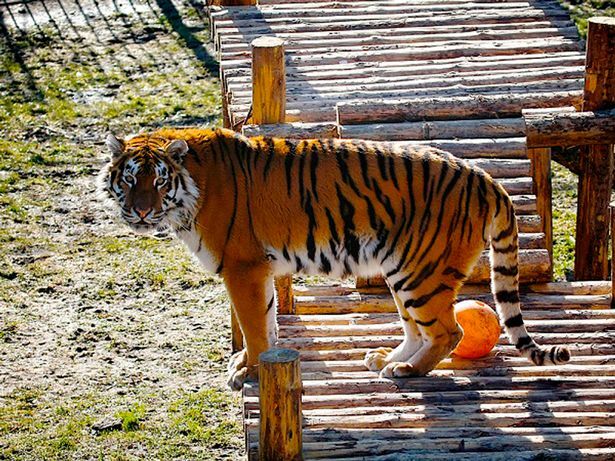 The unnamed employee at the Kaliningrad Zoo in Russia was badly mauled but was rushed to hospital is expected to survive. 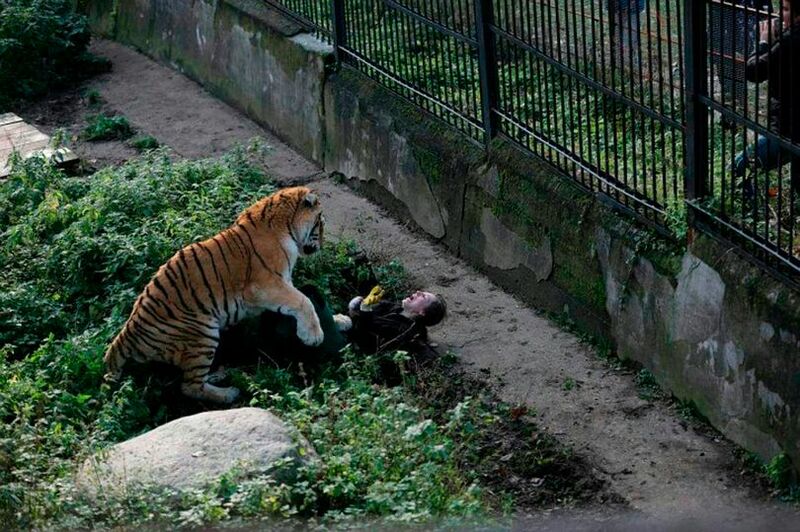 Alarming pictures show the woman on the back on the ground with the tiger on top of her seemingly going for the kill. But at this point, the zoo visitors' screamed, shouted, and threw stones and other nearby objects to try to catch the tiger's attention. The commotion alerted other visitors who ran to join the hero onlookers saving the woman who was able to run to a secure part of the compound. "The girl's face face was bleeding," said one account based on the accounts of witnesses. "She screamed and tried to fight off the animal." Other zoo employees were not present at the moment of the surprise attack, and it was down to the Russian visitors to save the keeper. 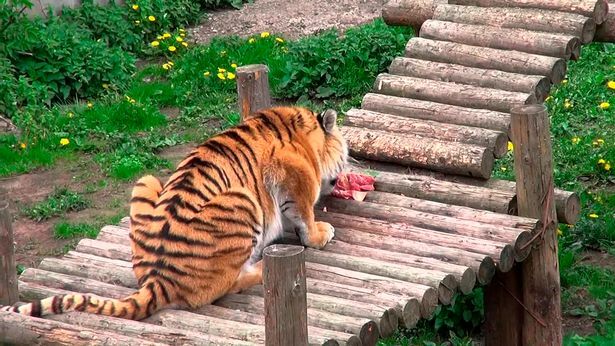 The Siberian tiger - the largest cat in the world - was supposed to be contained in another part of its compound when the woman brought its food. But there was clearly a problem and the cat - described as 'elderly' - was able to attack. A spokesman praised the visitors. "The animal entered the enclosure when the keeper was there," said a statement. "The tiger attacked the human. "Visitors with their shouting, stones and other improvisation managed to distract the animal. "This allowed the zoo employee to hide in a back room." It was even visitors who called an ambulance. Later zoo staff arrived at the scene and shot a sedative into the tiger. A local health ministry spokesman said: "The patient was delivered to the hospital with multiple wounds to the body and limbs. "She is conscious, her condition is assessed as stable but critical. "There is no threat to her life." The woman is in intensive care at a hospital in Kaliningrad, a Russian region wedged between the NATO and EU countries of Poland and Lithuania. The Siberian tiger was born on 1 July 2001 in Chelyabinsk Zoo before he was later moved to Kaliningrad Zoo. This year Typhoon turned 16. He has never attacked a keeper at any zoo in the past. In the wild such tigers - a critically endangered species - have a life expectancy of 15 years. "Typhoon has never before shown any aggression to zoo staff," said a source. But today the animal was "bad tempered" and "aggressive". The tiger was reported to be "stressed" after the attack and will not be destroyed, said Russian zoo officials. Contrary to earlier reports, the big cat was not sedated after almost killing the keeper, as eyewitnesses had claimed. 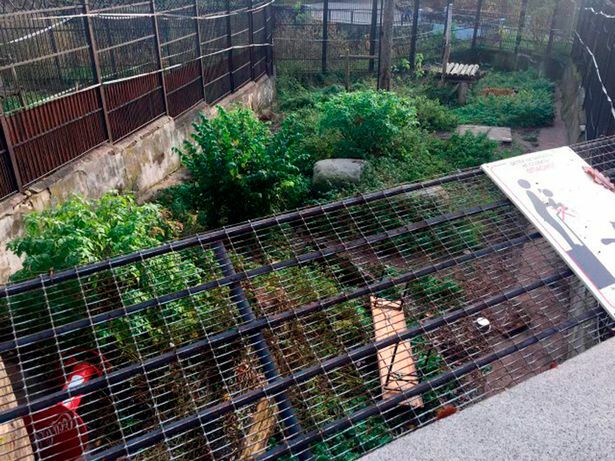 "The animal, which also suffered a lot of stress, is in its enclosure," said a zoo statement. "No measures will be taken against him." The predator is not being blamed for its attack on the keeper. 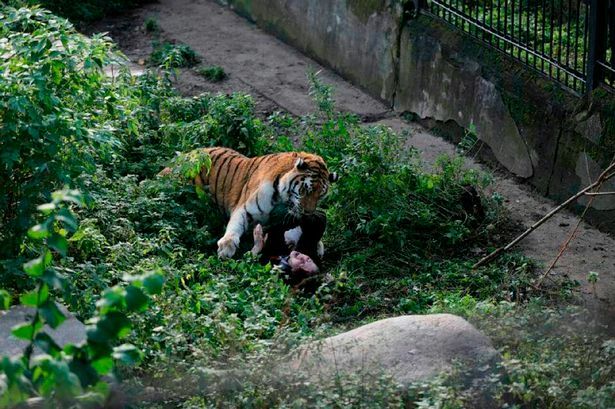 "This is the first time in the history of the zoo that a tiger attacked a man," said a spokesman for the zoo. 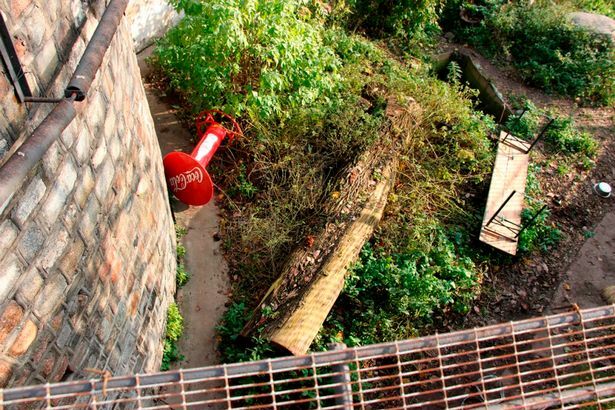 "An official investigation was launched to find out the reasons for the tragedy in the zoo." This involves both police and prosecutors. A spokesman said: "The Siberian tiger is a territorial animal. Protecting its territory is its natural instinct. "This animal acted in full accordance with its instinct. It was not aggression. It was the defence of its territory."